Peonies are quite the little powerhouses when it comes to perennials, so be very particular about where you plant them, since they may still be thriving there when your grandchildren become grandparents. It’s true: These long-lived favorites of florists, royalty and brides can flourish for 100 years or more and will keep on producing their beautiful blooms every year to liven up your flowerbeds in the spring and summer. They are easy to grow once established, come in a variety of hues and scents, and look lovely in bouquets. As an added bonus, deer are not fans of peonies, so this is a perfect addition to your deer-resistant flower garden. Native to the western United States and Canada, southern Europe and much of Asia, peonies are hardy to zone 3 and grow best in temperate or cold climates – particularly since colder winter weather brings better blooms when spring comes around. But while not all varieties will bloom to their fullest in the hotter parts of Southern California, they can be grown successfully here, particularly if you work with your nearest nursery to find the variety that will best thrive where you live. The majestic peony was once the national flower of China, is still Indiana’s state flower, and is the flower associated with 12th wedding anniversaries. The romantic, full blooms are often seen in wedding bouquets and are considered a symbol of a happy marriage and good fortune. Outside of the wedding scene, peonies symbolize honor, wealth, compassion, prosperity, nobility, and – of course – romance. But these pretty blossoms are not just for looks: Historically, they have been used for both medicinal and culinary purposes, and they are still used today as a home remedy, in salads, and floating delicately in punch bowls at garden parties. In Traditional Chinese Medicine, peonies are used to treat fever, inflammation, muscle cramps, rheumatoid arthritis, and a variety of other ailments. They have also historically been used in other parts of the world to treat respiratory conditions, such as asthma, and everyday ailments, such as headaches. 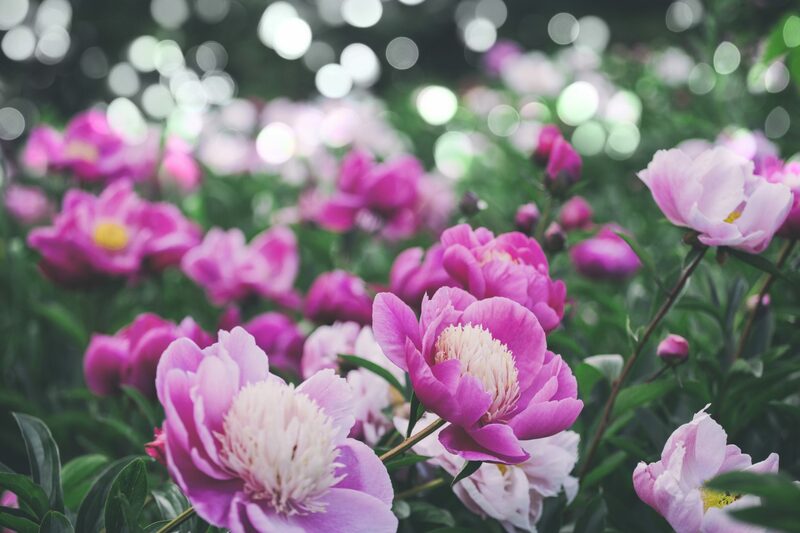 Today, some of the most common medicinal uses for peony root is the treatment of menstrual cramps, migraines, fatigue, polycystic ovary syndrome, cirrhosis of the liver, hepatitis, cracked skin, and stomach cramps. It should be noted that pregnant women should not use peony medicinally since it has historically been used to induce miscarriage, and that anyone considering using medicinal plants should first speak to their healthcare provider to discuss possible side effects and interactions with drugs or herbal supplements. Peonies come in two basic plant types: herbaceous plants and trees. Herbaceous peonies come in six basic flower types: single, double, semi-double, anemone, Japanese, and bomb. The types most often seen in Western gardens and bouquets are doubles, bombs and, less often, semi-doubles. 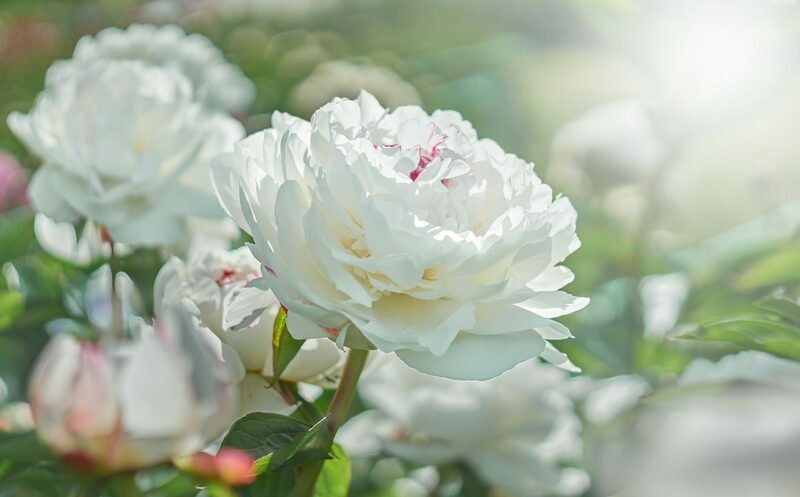 Work with your local nursery to choose the varieties that are best for your area and to find two or three cultivars with different blooming seasons so that you can enjoy beautiful peony blossoms in your garden for as long as possible each year. It is best to plant herbaceous peonies in the fall. If you live in an area that freezes, plant peonies before the first frost and at least a month before the first freeze. While you can plant peonies in the spring, peonies planted at this time usually do not do as well and take much longer to bloom. So, if you happen to have some peonies to plant in spring, go ahead and plant them, but know that you will likely have to wait one to two years to enjoy their colorful blossoms. Peonies do not like to be transplanted, but if you absolutely have to transplant them, do so in fall. If you are planting tree peonies, you can plant them in either fall or spring with equal success. The first step in planting peonies is to select a sunny location (or partially sunny if you live in a warmer area) that is protected from wind and where they will not compete with established shrubs or trees. They prefer neutral, well-draining soil. Dig a large hole and mix in any amendments you plan to use before planting your tubers. If you have the clay soil that is found in much of San Diego and Southern California, mix in some compost to lighten the soil before planting. Once you have prepared the site, plant your tubers about three feet apart and between one to two inches below the surface of the soil in your flowerbed. When you are planting peonies, always remember to point the buds (aka eyes) upwards. Be sure you give your peonies plenty of water after planting them to help them adjust to their new home. Peonies do not require much care once they are established. Keep the soil moist, but not wet, until they are established. Once they are established, you can cut back to watering about twice per week, but they will need extra irrigation during Southern California’s hot summers. If you live in a particularly hot, sunny area, it is a good idea to protect your peonies with some shade during hot weather until they are established. Deadhead your peonies regularly and keep your garden weed free to avoid competition for nutrients. If you are growing herbaceous peonies, cut them back in the fall and they will come back in the spring. Tree peonies require fewer freezing hours in winter and, therefore, are sometimes a better choice for folks living in coastal Southern California. If you grow tree peonies, you do not need to cut them back in the fall. If you have ever seen peonies growing in a garden, you have likely noticed that ants really like them. While this may be a reason to not plant them right outside your back door or next to your outdoor dining room, the ants are actually beneficial to your blooms. Peonies attract ants with their nectar, and as the ants crawl inside to get to this nectar, they help the blossoms open. As an added benefit, ants also eat some of the pests that would otherwise eat your flowers, so they offer natural pest control and should not be sprayed or discouraged.